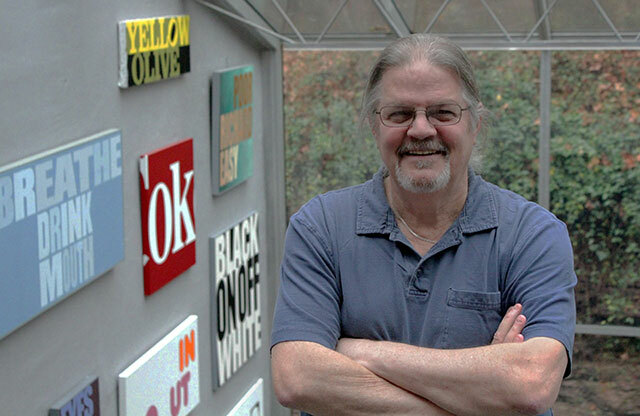 John Langdon is an artist, an independent graphic designer, a writer, and Typography professor at Drexel University. He is best known for his ambigrams, most notably those in Dan Brown’s best-selling novel, Angels & Demons. John’s forte is making abstract concepts visual, almost always through the design of words, letters, and symbols. Ambigrams. Logos. Words as art. As both an artist and a graphic designer, I specialize in the visual presentation of words. Language, philosophy, and science are interwoven into the design of words, which are manipulated to create surprising illusions. This unique approach culminates in a wide variety of corporate logos, and in ambigrams — words that can be read equally well from more than one point of view. Most of my ambigrams read the same when turned “upside down,” or rotated 180 degrees. I was an English major. That left things pretty open. I worked in the photo-lettering department of a type house. I got an excellent graphic design education from the pages of art directors annuals and design publications. After a few years at a Philadelphia design studio, I began freelancing in 1977 as a logo designer, type specialist, and lettering artist. I have taught typography and corporate identity design, at Moore College of Art from 1985-88, and since 1988 at The College of Media Arts and Design at Drexel University. Little by little I brought together my interests in language, symmetry, illusion, philosophy, and physics. My strongest influences along the way were Salvador Dali, the cubists, M.C. Escher, Rene Magritte, the psychedelic poster artists (especially Rick Griffin), and Herb Lubalin. My graphic investigations of the yin/yang symbol led to my re-discovery of the ancient Chinese philosophy Taoism, and has informed most of my work in one way or another. Writers who I have found inspirational include Edgar Allan Poe, Ogden Nash, John Barth, and Tom Robbins. In the early 70s, trying to do with words what Dali and Escher did with images, I invented (or discovered) what came to be known as “ambigrams.” In 1980, I discovered that Scott Kim had invented them, too, almost at the same time. The editor who wanted to publish my ambigrams seemed to think that a book needed text as well, so I dragged my writer self out of the closet, and Wordplay was published in 1992. Since 1995 I have taken my visual-verbal meditations and manipulations to canvas. My paintings still involve symmetry and illusion, a bit of philosophy, and a few puns thrown in for good measure.